Signature Authority and Agreement Negotiation: OGCA is the only UAF office authorized to accept research grants, contracts, and other related agreements on behalf of the University of Alaska Fairbanks. Documents requiring signatures must be reviewed and signed by an authorized representative located in OGCA. DO NOT SIGN any documents, or communicate any financial or institutional commitments unless it has been reviewed and approved by OGCA. Before an award can be accepted by the University of Alaska Fairbanks, OGCA completes a comprehensive review of the award, including the terms and conditions. OGCA is responsible for conducting all negotiations with sponsors to obtain mutually-acceptable language which will allow UAF to accept the award. Every negotiation is handled by the OGCA Management Team and, depending on the nature of the terms to be negotiated, may require input and assistance from other offices such as the Office of Intellectual Property and Commercialization, the Office of General Counsel, Office of Research Integrity, etc. While OGCA works diligently to resolve all negotiations in a timely manner, we cannot guarantee a timeframe for completion of negotiations. OGCA reserves the right to require changes based on specifics of a review, sponsor requirements, and/or changes to institutional policy. Just in Time/Supporting Proposal Information: Sponsor request for additional information after proposal submission. After a proposal has been submitted a sponsor may contact the PI or OGCA to submit supporting proposal information such as IRB/IACUC approvals, current and pending support, completion of sponsor specific forms, etc. PI should forward all sponsor requests to OGCA and OGCA will work with PI to respond to sponsor request. Any time a sponsor requests or requires a change in the originally proposed budget or scope of work, the Principal Investigator should always notify and coordinate a response through the OGCA before submitting a revised budget or scope of work to the sponsor. 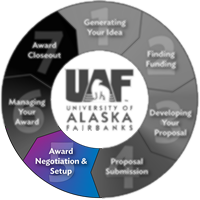 Awards in Hand: On occasion, sponsors begin negotiations by providing a draft agreement, award letter, or a check directly to UAF. In order to obtain University approval “after the fact”, PI should work with OGCA. Prior approval is required to create a sponsored research account in order to incur pre-award costs up to a maximum of 90 calendar days prior to the award start date. OGCA receives an award and issues a notification to PI and unit via email. At times awards may go directly to units. The FRABUDP checklist should be used and routed to OGCA when completed. If awards are sent directly to OGCA from sponsors, OGCA will initiate a FRABUDP keying checklist to the unit for processing. The unit will complete FRABUDP Keying Checklist and route to OGCA. Harmonization is a service OGCA offers to address the complexity of awards and funding to UAF. Harmonization involves a face-to face meeting with various stakeholders from the central offices and a unit/department. Harmonization includes a review of everything from the proposal to the Notice of Award. The Harmonization process is a communication strategy that has reduced the administrative burden by identifying and minimizing risks associated with managing extramural funds. Harmonization also provides an incentive for collaboration that aligns with OGCA’s mission and vision for creating a culture of accountability, responsibility, and transparency. Do I Need a New "S" number?